Today, much of the city is in ruins, and the usual point of entry is from the east through the Agra Gate (the other point of entry is via the present-day village and the Jami Masjid). The present road to the palace swings clear to the left, and below a triple-arched gateway, the Naubat khana. This point of entry would have led one straight to the first enclosure of the palace a vast courtyard in which emperor would daily public audience to his people, listening to their grievances and dispensing justice. With its pillars and floors decorated with tapestries and carpets, this Diwan-i-Am also functioned as a large hall for formal receptions and celebrations (Jahangir’s wedding took place here) and, on some occasions, even public prayers. 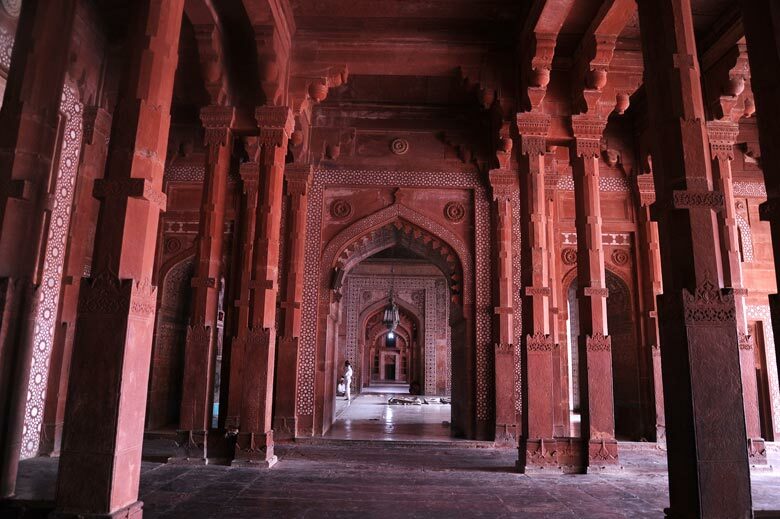 There is nothing grand or monumental about Akbar’s or architecture, but rather, a quiet elegance in it’s endlessly varied forms. Built almost entirely of red sandstone quarried on the spot, it has a restrained integrity in the use of this material, which is relieved only occasionally by trimmings of white marble and the odd blue-tiled roof. 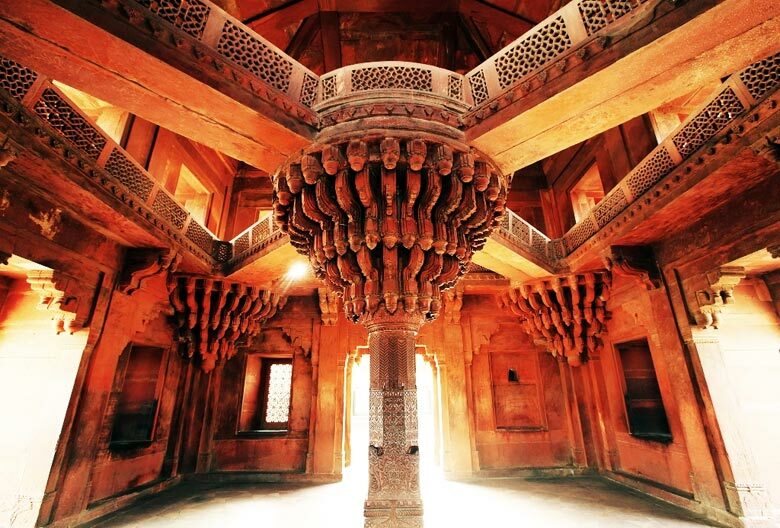 It is this subtlety and grace, coupled with the informal geometry of its planning and its fusion of Hindu and Islamic detailing that sets Fatelipur Sikri so distinctly apart from its ornate Mughal counterparts. Corresponding to the second and third enclosures of the camp layout is the large quadrangle containing all major functions of the palace proper, which was solely a male domain. 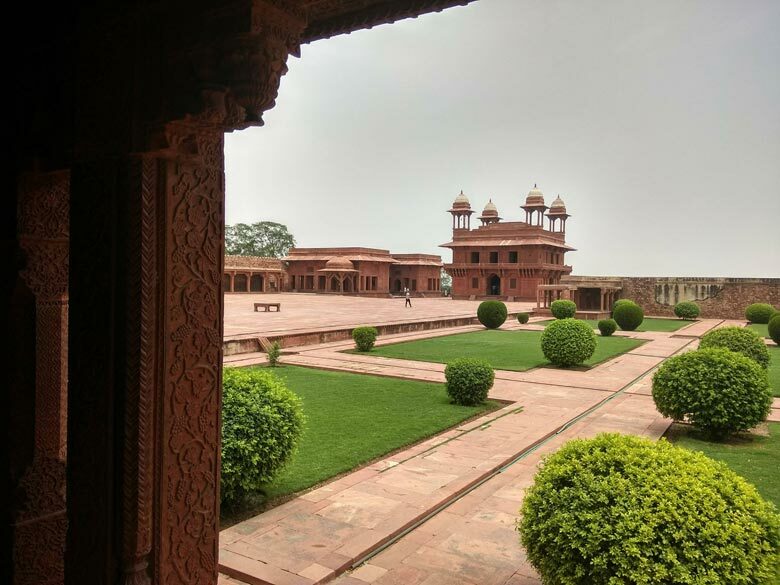 Every nobleman had to kiss its threshold before entering this enclosure, within which are perhaps the most celebrated buildings of Fatehpur Sikri. At the northern end of this court stands the elegant Diwan-i-Khas one of the best tourist places in Fatehpur Sikrim Agra. It is an astonishing chamber dominated by a massive, richly carved pillar, which supports fantastic capital: a circular arrangement of brackets, holding aloft a circular balcony to which narrow bridges run from each corner of the building. Yet the purpose of this extraordinarily inventive building remains ambiguous; it could have been the emperor’s private audience chamber, a discussion chamber of sorts, or even a storehouse for the royal jewels. Akbar sat suspended in air, as it were, atop this great capital, looking onto his palace, the monarch of all he surveyed. Imperial encampments on the march had a large open court separating the emperor’s private living quarters from the treasury and offices, an enclosure “lit up by the moon” where the emperor would sit with selected noblemen and visitors. 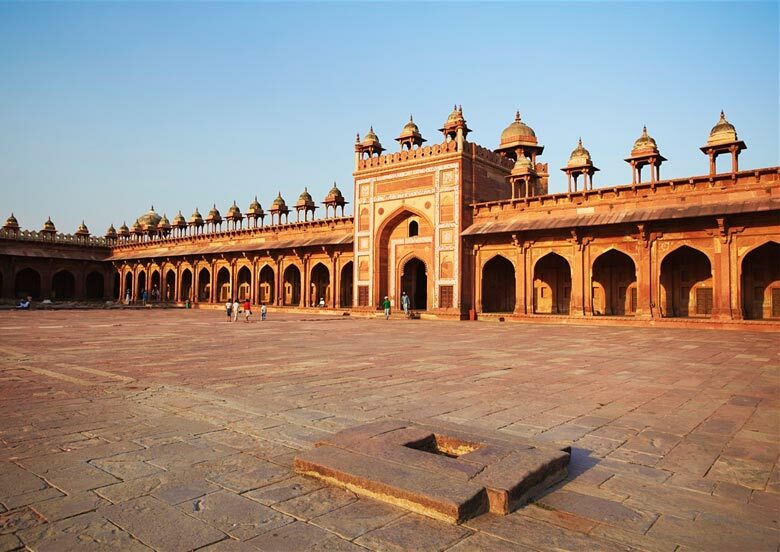 Here in Fatehpur Sikri, within the quadrangle forming the palace proper is an open stretch of sandstone; in its centre the paving is laid out to resemble the cruciform board on which the game of Pachisi is played. The popular myth has it that Akbar played the game with live pieces, and it may well be true. In Akbar’s day this court, transformed by screens, brocade awnings and rows of tall lights, must have been used for entertaining high-ranking courtiers and foreign envoys. Tucked into the southwest corner of this court stands a two-storey structure popularly but incorrectly called the Girl’s school. The presence of a great many deep shelves and niches, and a reference in chronicles to its location, indicates that it was most probably used as a storehouse for the special fruit and Ganges water that Akbar favored, and also as a pantry to reheat and serve food arriving from the kitchens located much further away. Clustered about a square pool, at the southern end of the large quadrangle, are the emperor’s private living quarters. Into the south wall of the court was built a once richly painted set of rooms, serving as Akbar’s private library and as the scene of his intellectual activities. He sat cross-legged on a high, carpet-covered platform, receiving noblemen and scholars whom he would involve in discussions lasting well into the night. Even though Akbar was illiterate, a wide range of literature used to be read out to him daily, and he managed to initiate a glorious flowering of intellectual and cultural activities in his court. He was responsible for the founding of an eclectic, syncretic religion, Din-i-Illahi , which, though it had only 17 followers, was a revolutionary concept for its time. 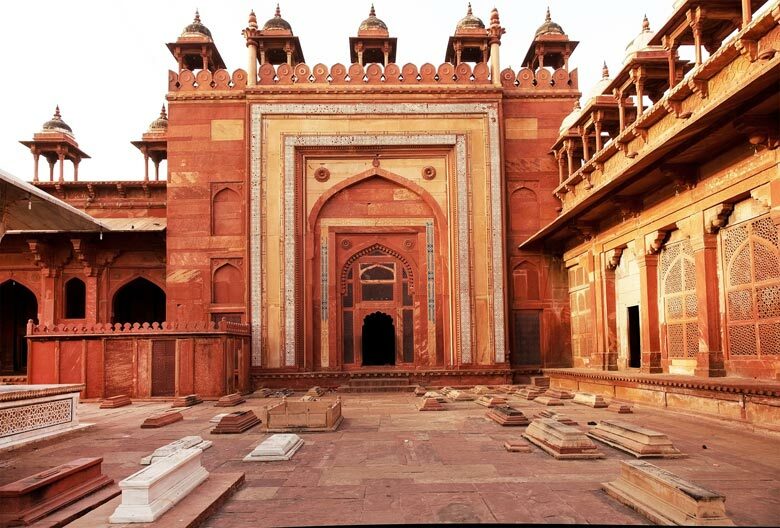 As Richard Lannoy wrote, even though Fatehpur Sikri was “a tragic political failure, its failure has nothing to do with its architecture, which remains the most perfect expression of the liberal society which [many] Indian rulers have vainly striven to realise”. A window in this room looked out into the court of the records office or Daftar khana through which he would address his officers and administrators. Hot and cold water, depending on the season, flowed in channels cut into the floor, warming or cooling the space. Above this “drawing room” and library was a small, beautifully painted chamber, popularly called the Khwabgah which literally means “palace of dreams”. In this bedroom, profusely surfaced with gilt calligraphy and images from Persia and Turkey, his wives could easily visit him via a screened passageway (now partially broken) coming from the main harem. A central axis runs through the palace courtyard, piercing the Diwan-i-Khas, the Pachisi court, the Khwabgah and the offices of the Daftar Khana in a single imaginary line. 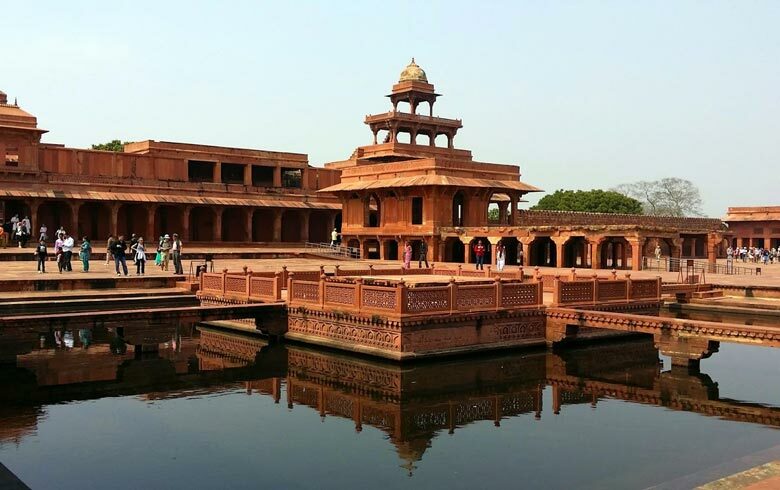 Sitting up in his dream chamber overlooking the pool, Akbar could thus have a direct view of his Diwan-i-Khas to the north and his office to the south, with the entire red sandstone palace before him. Contrasting with Fatehpur Sikri’s red sandstone expanses, the green waters of the square pool are bridged by a cruciform causeway leading to a central platform where Akbar would sit in the evenings. Looking onto the pool, in a corner of the court, is a tiny but exquisitely ornate pavilion, the Turkish Sultana’s residence. Situated as it was, however, in a male part of the palace, it was more likely to have been the site of the emperor’s private discussions. While other buildings in Sikri were elaborately ornamented with painted wall surfaces and tapestries, this miniature structure is rich and unified in its carved imagery and intricate sandstone embellishments. The carved motifs — date palms, pomegranates, fauna and curling clouds — speak of Persian, Turkish and even Chinese influence. “The gardens painted on these walls are on level with the garden of paradise, must visit tourist places in Fatehpur Sikrim, Agra”. Unfortunately, time and Sikri’s harsh climate have taken their toll, leaving only faded reminders of this beauty. Built at the highest level in the palace is the main harem, commonly called Jodhbai’s palace. Solemn and massive, this imperial residence is probably the most important, and certainly the largest, of all the buildings imperial in the palace. The staggered entrance assured its inmates privacy and safety as did a force of eunuchs. Arranged around a great central court are a series of rooms forming the living quarters of Akbar’s many wives, including a supposedly converted into a temple for the Hindu princesses. Here we observe the most interesting fusion of stylistic detailing: local elements from Gujarat Mandu and Gwalior are blended with traditional Islamic designee to from the distinctive early Mughal features, including the elegant tulip pattern which was to characterize Sikri. The only splash of colour in all of Sikri is furnished by the bright blue tiled roofs of this building. A small screened wind-tower — the Hawa Mahal one of the best tourist attractions in Fatehpur Sikrim Agra- attached to this palace permitted the emperor to spend hot summer evenings in a carved chamber with the cool northwesterly breeze wafting through. A screened viaduct emanating from the north wall of the harem gave the imperial women private access to lakeside pavilions, and to the weekly bazaar spread out at the foot of the palace. The third residence in the women’s domain was the beautifully carved palace generally ascribed to Birbal, the legendary wit and most favoured of Akbar’s courtiers. Birbal could most certainly not have lived here; nor could any other male, since it was an integral part of the harem. 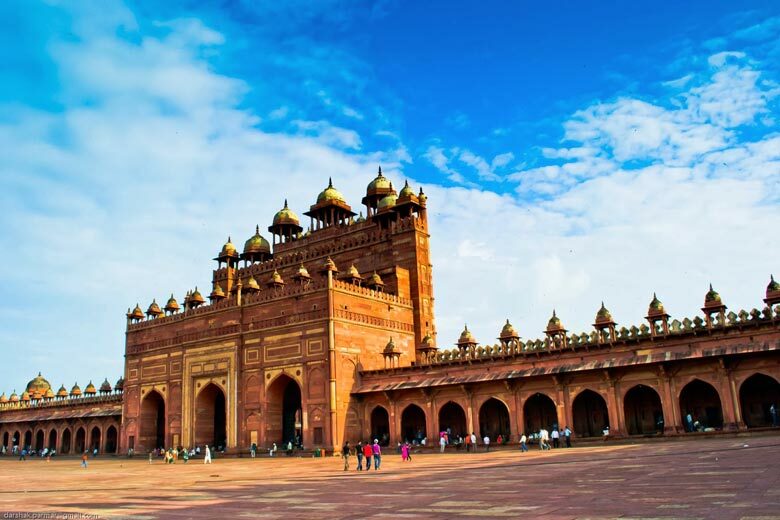 Travellers have called it the finest domestic building of Sikri, and if the main harem is to be exempted, the richness, extent and intricacy of carving on all its surfaces, as well as the glorious view it commands of the lake, aptly justify the epithet. Every square inch of wall and ceiling is overrun by swirls of tiny flowers, interlocking octagons and lotus blossoms, so delicate and profuse that the interior gives the illusion of stone carpeting. The prominent style of decoration seems decidedly Hindu. 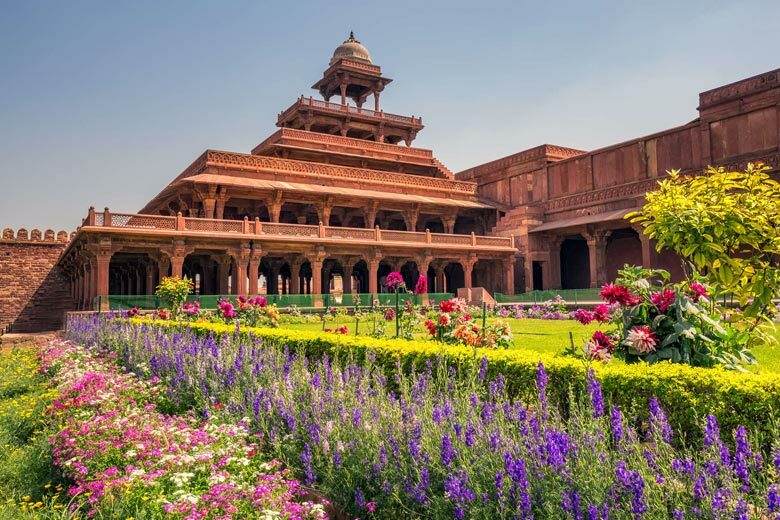 Relieving the starkness of the hot, red sandstone, we come upon a patch of green, overlooking and stepping down towards the lake — a formal Mughal garden laid out on the “Charbagh” principle, emulating the gardens of paradise. Once walled in for privacy, it was central to the three female establishments of the palace, complete with a small bathhouse, pavilions and a central fishpond. Water from the lake was fed to the garden through aqueducts, and running into the pond over a wall pierced with niches for oil lamps, it formed a glittering veil as it fell over the flickering lights. In the heat and dust of Sikri, basements could have offered respite in hot summers, but were difficult to carve out of the rocky outcrop. As an alternative, breeze-catching wind towers were constructed, rising into the skyline in fairy-tale forms. 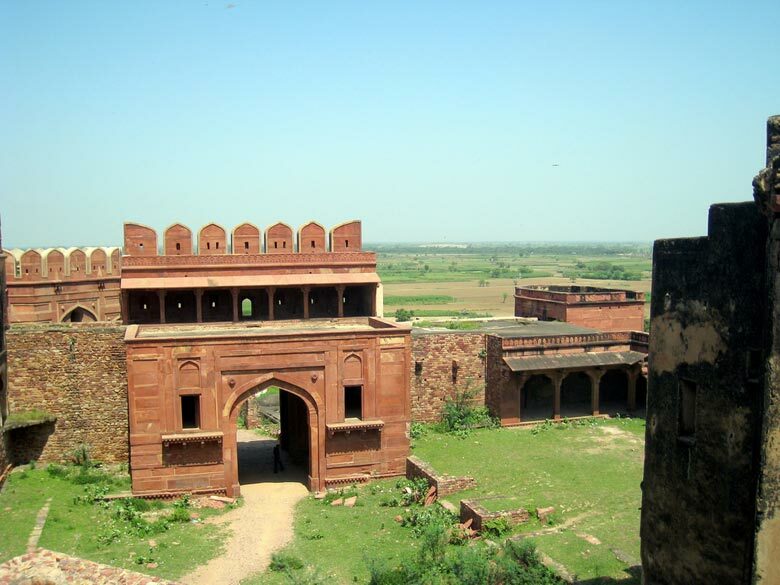 Lending particular emphasis to the silhouette of Sikri is the famous Panch Mahal one of the best tourist places in Fatehpur Sikrim, an extraordinary structure, entirely columnar, consisting of five storeys of upwardly decreasing size. Its 176 columns, of which no two are exactly alike (except for pairs), offer a veritable museum of styles, many of Hindu inspiration. Set into a corner formed by the “male” and “female” zones of the palace, this pleasure pavilion was used by Akbar and his special consorts. Opening out towards the lake, it commanded a magnificent view of the imperial palace below. While the “palace proper” occupied the upper strata of the ridge, the slopes accommodated the various service functions of the royal palace. Amon these are still discernible the kitchens and baths to the south, workshops (the Mint) to the northeast, and elaborate water-works near the lake. This northern aspect formed the second approach to the palace, possibly the major imperial entrance, with the royal entourage arriving on elephants and horses past the lake, up a long ramp, and through the monumental doorway called the Hathi Pol or Elephant Gate. Now ruined (possibly by the zeal of Aurangzeb), a pair of splendid rubble elephants, 3 m (10 ft) high, once welcomed arrivals to the palace. From here, the imperial women could enter the harem discreetly via the screened passage, and the emperor could approach his offices from doorways in the north. The feel of the site, and the open vistas of the citadel, with its wide ramps and high gateways for elephant movement, contribute to the dramatic character of most of the palace approaches from the north. Unfortunately, it is no longer possible to approach the palace from this direction. Beside the lake were dotted recreational spots — water pavilions, baths, and even a polo ground, a game of Inner Asian origin of which the emperor was particularly fond. Dominating the lakeside view from the palace, and rising 21 m (70 ft) into the air, is an amazing tower-like structure, studded with upward curving stone cylinders, like a collection of elephant tusks. Its popular name, Hiran Minar, meaning “deer tower” is of later origin, having nothing to do with its function, which remains ambiguous. Its positioning seems to imply a sort of marker — a tall milestone visible from afar, signifying the royal entrance to the palace. The large man-made lake helped solve the city’s water supply problem. A carefully detailed system transported water to a great well, lifted it up in stages over cattle-drawn wheels and supplied it via aqueducts to all parts of the palace. A covered drainage system was ingeniously incorporated in the level differences of the palace courtyards, and the water was cleverly run off, stored and recycled. The extensive and complex Court Baths, on the southern slope behind the Records Office, are somewhat reminiscent of the Roman baths of Caracalla, though on a more intimate scale.